A 14 inch Mahogany carved plaque the famous HAL-4 Red Wolves. A perfect piece to document your squadron lineage in your goat locker! 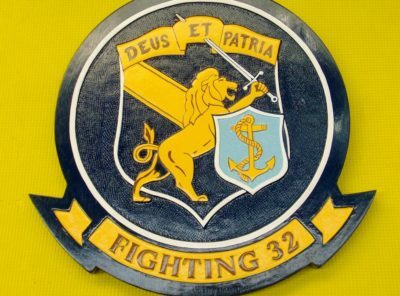 Helicopter Sea Combat Squadron 84 (HSC-84) “Red Wolves” was a helicopter squadron of the United States Navy Reserve. 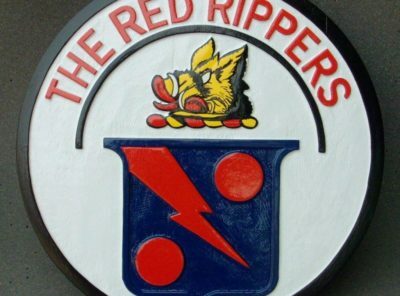 Along with the “Firehawks” of HSC-85, the “Red Wolves” were one of only two squadrons in the U.S. Navy dedicated to supporting Navy SEAL and SWCC Teams, and Combat Search & Rescue. They prior to their deactivation in March of 2016 they operated eight HH-60H Rescue Hawks organized into four independent, two aircraft detachments that could deploy anywhere in the world within 72 hours of notice. The Viet Cong had given the title “Seawolf” to HAL-3. In Vietnamese, their words for it would be “Shoi Ben”. 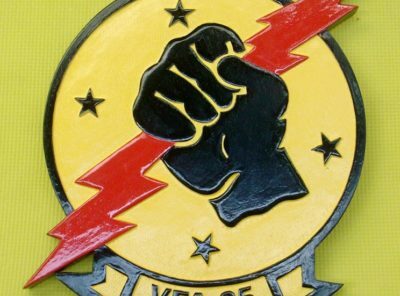 The colors on the shield are taken from the Republic of Vietnam Flag, the Ace of Spades is the card of death, the trident represents the squadrons’ sea heritage, the flame their power to sustain. The Wolf is Lowenbrau. 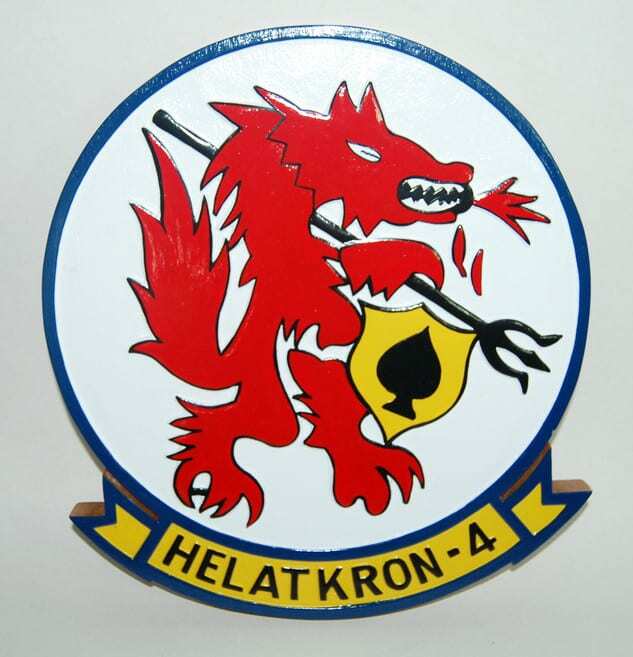 Many of the aspects of the original HAL-3 logo were kept. 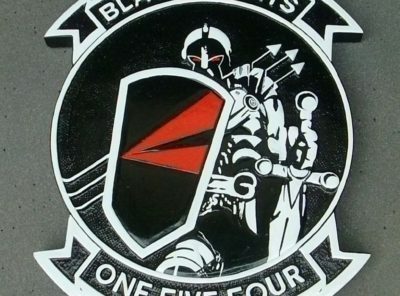 With the exceptions of the blue wolf and the color of the shield. 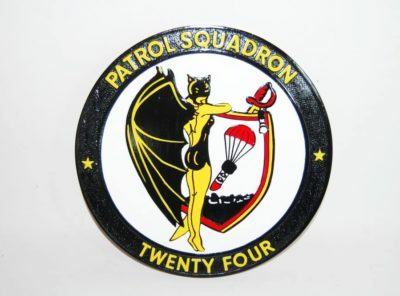 HSC-84 can trace its squadrons’ lineage to Helicopter Attack Light Squadron 4 (HAL-4), which was established on 1 July 1976 at NAS Norfolk, VA by CDR James L Poe, USNR and CDR Theodore G Sholl, USNR. HAL-4 was equipped with Bell HH-1K Huey gunships to provide dedicated aviation support for Naval Special Warfare (NSW), Explosive Ordnance Disposal (EOD) and Special Warfare Combatant-craft Crewmen (SWCC) Teams. 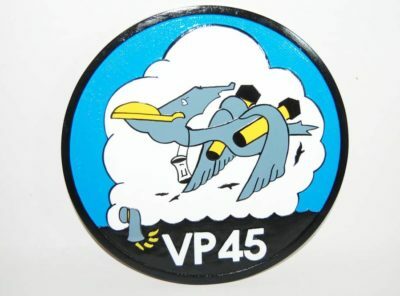 HAL-4 continued the traditions of its predecessor HAL-3 “Seawolves”, which was established on 1 April 1967 in Vietnam as the only Helicopter Attack Squadron in the Navy. Operating the UH-1/HH-1, HAL-3 proved the concept of using specially outfitted naval helicopters to provide insertion/extraction and direct fire support, for Naval Special Warfare Teams and Riverine Forces. HAL-3 was disestablished 16 March 1972. HH-60H at Balad Air Base in Iraq, 2008. On 1 October 1989, HAL-4 was re-designated Helicopter Combat Support Special Squadron 4 (HCS-4). Along with a change in designation, HCS-4 also received the HH-60H Seahawk and added Strike Rescue to its primary mission of Naval Special Warfare support. 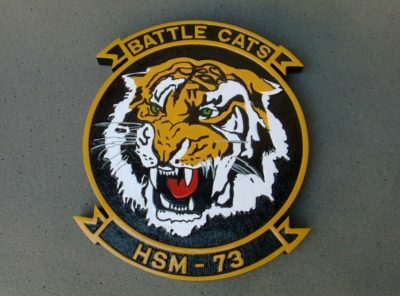 In December 1990, HCS-4 was mobilized and deployed one detachment to Saudi Arabia in support of Operation Desert Shield/Desert Storm marking the first use of the HH-60H in combat. Using the squadron’s capability to independently deploy to remote sites, four helicopters with support personnel were based at RSAF Tabuk, Saudi Arabia and operated from forward bases at Al Jouf and Ar’Ar (an alert strip 10 miles from the Iraqi border). Living in and operating out of tents, HCS-4 provided 24-hour Strike Rescue and Special Warfare support to coalition forces. In September 1994, HCS-4 was once again called upon, this time in support of Operation Uphold Democracy in Haiti. In less than 48 hours, two aircraft with support personnel were equipped and ready for combat operations aboard ships of the Atlantic Fleet. 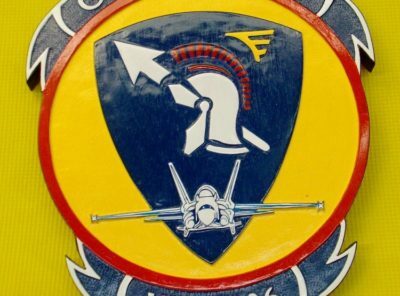 The detachment initially deployed aboard the USS Dwight D. Eisenhower (CVN-69) before splitting into two single aircraft detachments, one crossdecking to the USS Vicksburg (CG-69) to provide Special Warfare support and the other to the USS Comte de Grasse (DD-974) for Strike Rescue Support. In January 1996, HCS-4 deployed a one helicopter detachment in support of the USS George Washington (CVN-73) during its deployment to the Adriatic Sea for Operation Joint Endeavor. 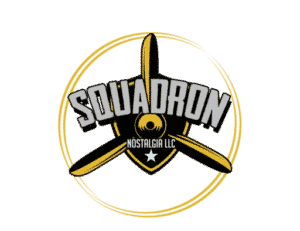 The detachment completed the squadron’s first ever six-month deployment seamlessly integrating with Helicopter Anti-submarine Squadron 5 (HS-5) in support of operations in the Balkans. In September 2001, HCS-4 was winding down a successful mini-detachment to Ft. Belvior, VA when the morning of September 11th, 2001 they received word of a terrorist attack on The Pentagon. Detachment personnel quickly loaded up one aircraft with medical supplies and launched it to the Pentagon. Upon arriving at the Pentagon the aircraft and crew maintained a standby alert posture for the next few days. In March 2003, HCS-4 was once again called upon to deploy in support of Operation Noble Eagle and Iraqi Freedom. HCS-4 deployed four helicopters and support personnel to support this mission. Two helicopters and support personnel were stationed in Akrotiri, Cyprus. Two helicopters and support personnel were stationed on the USS La Salle (AGF-3) and the USS Nashville (LPD-13). 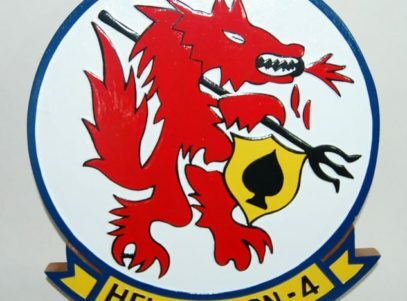 On 1 October 2006, HCS-4 was redesignated Helicopter Sea Combat Squadron Eight Four (HSC-84). HSC-84 continued to be the forefront in the U.S. Navy as the premier Rotary wing Special Operations support.